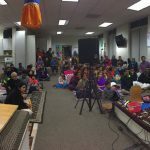 By the immense grace of Sri Swamiji, a seven day discourse series on Srimad Bhagavatham was conducted in Detroit, Michigan from December 13, 2012 to December 19, 2012. 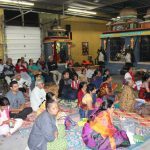 The lecture series was conducted at the newly inaugurated premises of Sri Balaji Temple of Great Lakes in West Bloomfield, Michigan. 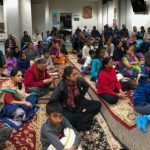 The lecture series was organized by Sri Sridhar Venkatachari from Detroit GOD Satsang. Close to 150 people attended the discourse series daily. Sri Ramanujamji enthralled everyone with the divine nectar of Srimad Bhagavatham. On the first day, he talked in detail about the birth of Srimad Bhagavatham and then elucidated on the first five verses of Kunti Stuti. In his exposition, he vividly narrated how Kunti recalled all the tribulations that she went through and how Krishna came to her rescue and the rescue of her sons . He concluded the first day’s discourse with Kunti’s prayer to Lord Krishna to bless her with more trials and calamities since during tough times, Lord Krishna was always with her and gave her darshan. On the second day, Sri Ramanujamji delineated on Bheeshma stuti, his instructions to Yudhistira about dharma and how he revealed the thousand names of Lord Vishnu, the Vishnu Sahasranama that is being chanted till date. He beautifully explained that the eleven verses in Bheesma stuti signify the ten Indriyas and the Manas. The devotees were listening with rapt attention and were moved to tears when Sri Ramanujamji described Bheesma’s final moments and how he merged with Lord Krishna, who was standing right in front of him. On the third day, he talked about King Parikshit in detail, his reign and his encounter with Kali Purusha. 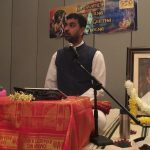 On the fourth day, Sri Ramanujamji listed King Parikshit’s questions to Sage Suka and explained Sage Suka’s answer in fine detail. He later expounded on the life-history of Dhruva. The life-history of Ajamila, Vritrasura’s and Lord Prahalad’s charitra were reminisced on the fifth day of the discourse series. He instilled the precept that one who remembers Lord Prahalada or Lord Narasimha during the final moments of life, is instantly liberated. 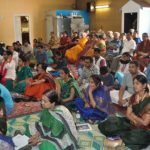 On the sixth day, the lecture was on Gajendra Moksham, Ambarisha’s life-history followed by beautiful exposition of the divine plays of Lord Krishna. 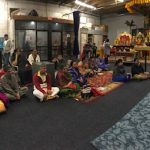 The seven day discourse series culminated with a wonderful discourse on Rukmini Nayaka – the divine vivah between Lord Krishna and Rukmini Devi.